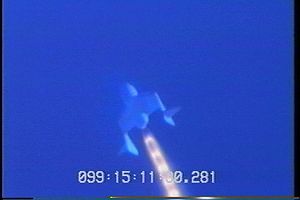 SpaceShipOne on its second rocket powered flight April 8, 2004. Taken from Edwards AFB ground radar facility. This section contains brief articles concerning developments in the field of reusable launch and space vehicles with links to news sources, NASA, company sites, etc. & innovations by small rocket companies. amateur space activities, space businesses, etc. NSS's 23rd International Space Development Conference - May 27-31 Oklahoma City, Oklahoma. Mars Society's 7th International Conference - August 19 -22. Chicago, Illinois. ... X PRIZE Space Race News posts the latest Ansarr X PRIZE Newsletter: May 28 2004. Holiday break... I will be traveling over the next week or so and postings will be even more intermittent than usual and probably none at all over this weekend. Orbital airship update... A recent posting on Slashdot about the orbital airship concept drew several hundred responses. Blimps... In... Space... - Slashdot - May.25.04. Alfred Differ of JPA responded to some of the comments and questions: Alfred Differ - Slashdot User. Note that their first choice of an engine, which they say they are under contract not to reveal, is not an ion engine. Phoenix may rise higher... The latest issue of Aviation Week reports that Germany wants the Phoenix spaceplane prototype added to ESA's new Future Flight Preparatory Program (FLTP), which was mentioned by Dave Salt at Space Access ' 04. After the current low altitude drop tests in Sweden are finished, they would like to do high altitude drops from a balloon or a Mig-31 to test transonic speed range. Space Show interviews... Check out the SpaceShow interview with TGV Rockets chief Pat Bahn this Sunday between 12-1:30PM Pacific Time. Pat will be speaking from the NSS Space Development Conference, which will take place over the Memorial Day weekend in Oklahoma City. He will discuss progress in the development of the MICHELLE B suborbital vehicle, the growth of the company at its new residence in Norman, Oklahoma, and about the activities of the Suborbital Institute, which he also leads. You can also find in the archive the recent show with Rick Citron who discusses the companies Kistler Aerospace and Spacehab, both of which he help to create with his brother Bob. In the first half of the show he gives an interesting overview of the steps potential space entrepreneurs must take to raise money and get a company off the ground. Michael Kelly: Culture Clash: One More Attempt to Change the Lexicon (ppt) - discussion of new terminology to replace "launch" and RLV when referring to the new space transport systems. Michael Kelly: COMSTAC RLV Working Group Meeting Report (ppt). Brant Sponberg Centennial Challenges presentation (ppt) - interesting timelines and suggestions for possible competitions. ... Reader K. Kert points to some interesting articles in the Microcosm publications section. X PRIZE models... 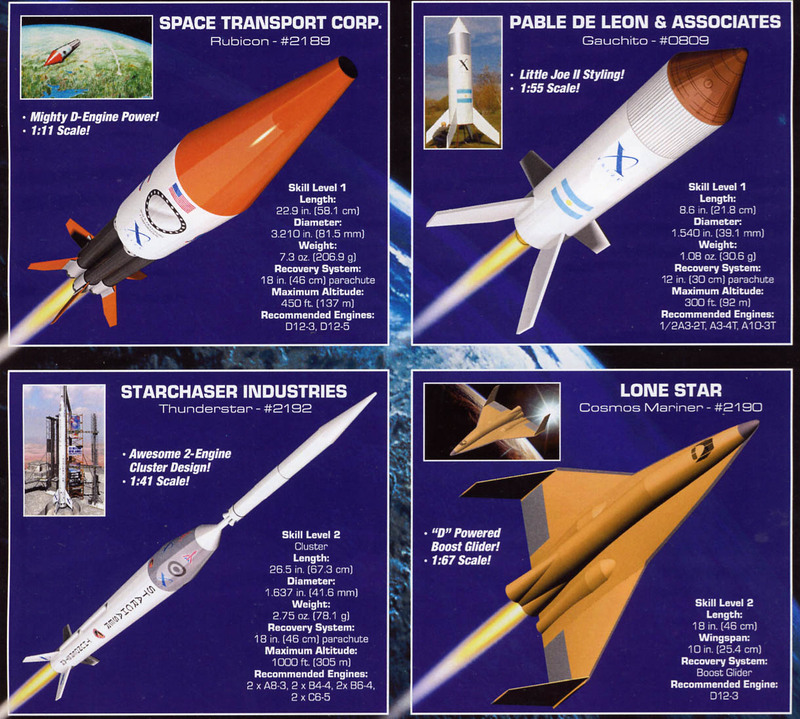 Yesterday the X PRIZE announced that the Estes Rockets company is releasing a set of models based on several teams' designs. 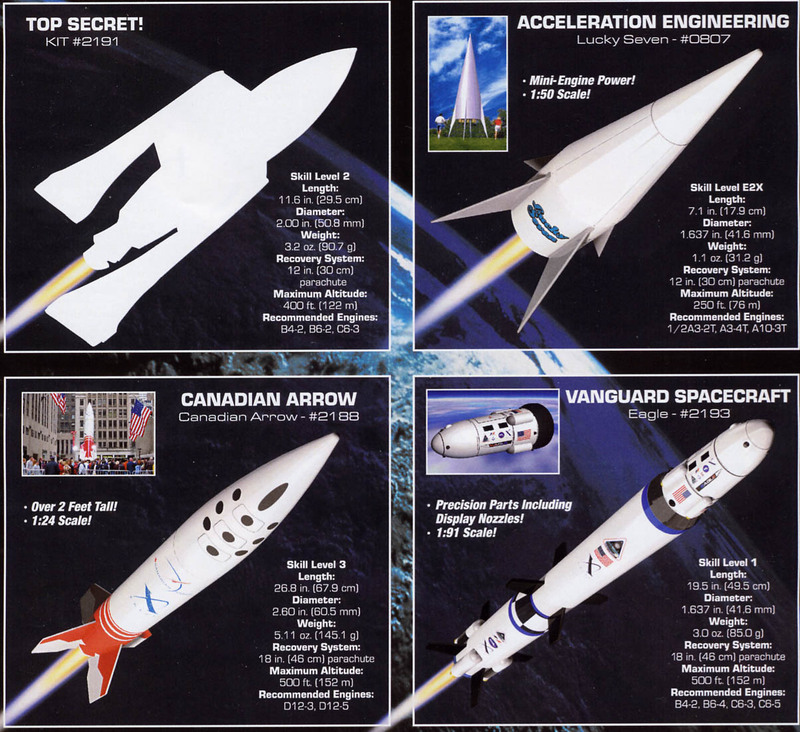 The Estes site doesn't yet show the models as far as I can tell but Alan Boyle - Small-size X Prize - Alan Boyle: Cosmic Log - May.25.04 - found images at Ye Olde Rocket Shoppe on sell sheet #1 and sell sheet #2. Note that the model for the SpaceShipOne is still under negotiations with Scaled Composites. ... The web site for the Third International Symposium on Beamed Energy Propulsion, which will be held Troy, New York, October 11 - 14, 2004, is now up and ready for registration. Flometrics pistonless pump update in the experimental rocketry section. Includes a gif animation. ... Show support for private launch development by shopping at the X PRIZE Store | CafePress and other RLV stores. The Rocket Company comes to an end. The final installment tells how the founder of the Rocket Company seeks to reduce the cost of transportation to Mars just as he did for access to LEO. If successful, large numbers of people will be able to travel to the Red Planet for permanent settlement. Artful space forecasting....The 2004 Commercial Space Transportation Forecasts is now available. It gives a broad and informative survey of the launch industry. The report is create by Futron under contract with the FAA-AST. Jeff Foust is deeply involved with this report and also Phil Smith, who created the gorgeous cover art as well. Hybrid jet/rockets left behind? The COMSTAC meeting this week included a discussion of HR-3752 - Commercial Space Amendements Act - according to Jeff Foust: Space Politics: HR 3752: a concern over definitions - Space Politics - May.20.04. The bill was passed by the House and referred to the Senate. It includes a number of items directly related to the regulation of commercial suborbital spaceflight and it was a focus of the recent Suborbital Action Day campaign on Capitol Hill. According to Jeff, a concern was expressed that the bill doesn't properly address the question of what regulatory framework would apply to vehicles that initially takeoff under jet power and then fire a rocket when they reach a high altitude. Unfortunately, if the bill is altered to fix this, then the bill may die because of the short time remaining in a year with lots of backed up legislation. Hey, don't tell me what the question is! Don Peterson has contracted a serious form of myopia called Zubrinitis. The sufferers look into space and can't see anything but Mars: Former Astronaut Don Peterson's Ideas for Future Human Flight Programs - SpaceRef - May.20.04. Rand Simberg gives a similar diagnosis. Centennial Challenge Workshop Reminder... Ken Davidian, who now works with the Centennial Challenge project, asked me to remind people about the upcoming workshop. Inspired by the X PRIZE, NASA's Centennial Challenge will offer prizes for a wide range of space related accomplishments. The goal of the workshop is to: 1. Gather ideas for Challenges, 2. Develop rules for specific Challenges and gauge competitor interest in various potential Challenges, and 3. Promote competitor teaming. The record breaking CSXT launch is discussed in the Advanced Rocketry News section. Suborbital Action Day went quite well yesterday. The Suborbital Institute teams briefed staffers for 27 different Senators. As described by the talking points posted by Andrew Case - SubOrbital Day - Transterrestrial Musings - May.17.04 - the primary goal was to encourage passage of the Senate version of the HR-3752. This bill aims to help set a regulatory and liability regime that will facilitate the creation of space tourism and other markets once the suborbitals graduate from the current development phase. Other priorities involved ameliorating the ITAR mess and keeping the Office of Space Commerce alive. Suborbital Action Day on Capitol Hill so no updates till late this evening. Check the Armadillo site for the regular update. The Rocket Company narrator looks back at progress made during the ten years that followed the introduction of the DH-1: Epilogue 1.
da Vinci Project launch this summer is on track according to these articles (via X PRIZE Space Race News): He's got his eyes on the Prize - TheStar.com - May.15.04 * Cape Kindersley blasts off - TheStar.com - May.15.04. Video of the SS1 flight is available without a required registration at this site: Rocket Reaches the Edge of Space - Hampton Daily Press/LA Times - May.14.04 (via Alan Boyle). The ride may be suborbital but it sure looks like spaceflight to me! And there's still another 40 miles ahead. For people who have the money, these kind of trips are going to be irresistable, even if they do only last a few minutes. Space Transport test... Alan Boyle also reports that Space Transport launched one of their 3-stage sounding rockets and it exceeded 150k feet. Unfortunately, they lost track of it when the GPS unit failed. "Shortly after his flight, a very excited Melvill told CNN that seeing the sky go from blue to black was the thrill of his life. "'I feel great, it was fabulous. I would pay a million dollars to do that again,' he said." ...Rutan said he hopes to go after the prize this summer. 'With today's flight, much of the major technical challenges have been overcome,' he said. 'It's just a matter of going higher with more people.'" ... Several people pointed out in the Scaled press release (see below) the statement, "We will be sending you advance notice of a media event at Scaled very soon." This may refer to the 30 day notification before a 100km official flight that is required by rule 6 in the X PRIZE guidelines. Got a feeling there will be quite a crowd heading to Mojave to watch each of the two flights. Launch conditions were 46,000 feet and 120 knots. Motor light off occurred 10 seconds after release and the vehicle boosted smoothly to 150,000 feet and Mach 2.5. Subsequent coast to apogee of 211,400 feet. During a portion of the boost, the flight director display was inoperative, however the pilot continued the planned trajectory referencing the external horizon. Reaction control authority was as predicted and the vehicle recovered in feather experiencing 1.9M and 3.5G’s.Feather oscillations were actively damped by the pilot and the wing was de-feathered starting at 55,000 feet. The onboard avionics was re-booted and a smooth and uneventful landing made to Mojave. This morning, the SpaceShipOne team completed another successful test of key systems on the SpaceShipOne reusable launch vehicle (RLV) and its carrier aircraft, White Knight. SpaceShipOne achieved 212,000 feet [64.6km] this morning. This flight marks an additional milestone for Paul G. Allen, Burt Rutan and the innovative aerospace design team in their ongoing efforts to complete the first non-government manned space flight. The test is part of Scaled Composites' Tier One program, funded by Allen, Microsoft co-founder and CEO of Vulcan Inc. The SpaceShipOne team will announce the results of this test flight once it has completed an analysis of the data. Look for this information under the Test Updates tab. Information on any future flights will also be provided on the web site, www.scaled.com. We encourage you to check this page frequently for updates. We will be sending you advance notice of a media event at Scaled very soon. New Mexico gets the X PRIZE Cup according to this report: New Mexico Hosting Spaceflight Competition -Space.com/AP - May.11.04 (via spacetoday.net). Nothing yet on the X PRIZE home site. Armadillo hovering ... John Carmack reports on more progress with hover tests of a small test vehicle using a single engine with jet vanes for control: Position hold, big jet vanes - Armadillo Aerospace - May.8.04. Several videos included. They already expect to do a hover test of the big vehicle by next weekend. ... Some of the amateur and small company launcher developers are getting quite good at attracting sponsors. Canadian Arrow, da Vinci, and Starchaser seem particularly successful. Now I see that the US Civilian Space eXplortion Team is doing pretty well also. The Rocket Company looks at ways steadly to increase the size of the payload reaching orbit in upgraded versions of the DH-1. See Chapter 26. News brief... More about XCOR and Mojave Spaceport licensing: License gives XCOR boost - Antelope Valley Press - May.6.04. Canadian Arrow is pleased to announce that it will begin unmanned test flights of its rocket this summer. The flights, taking place over a period of four months beginning in August, will test the Arrow’s launch pad abort system and escape systems. This testing will be essential before any manned launches are attempted. A launch pad abort test, including testing of the powerful solid rockets that pull the crew cabin to safety in the event of problems while the rocket is on the pad. Separation of the nose cone from the crew cabin. Deployment of parachutes for safe recovery of the nose cone and crew cabin. Testing of aerodynamics to ensure the rocket is able to reach the correct altitude and does not display any flight characteristics that are not normal to flight. Onboard computer to record data including acceleration, vibration, pitch, yaw and roll of the rocket. Onboard video camera aimed out the same window as the astronauts will use. Video will be available to the media after the flight. Vehicle will weigh 2,500lbs at liftoff. Crew cabin (space capsule) designed to carry three astronauts 65 inches in diameter and 6 ft tall. The Canadian Arrow will also fly its first XPOD experiment, produced by students at the Canadian Arrow Science Club at John Dearness School in London. The flight will test the durability of the XPOD. Canadian Arrow is a London-built rocket, competing for the $10 million (US) X PRIZE, which will go to the first team that can launch a passenger space vehicle 100 kilometres into space, land safely and repeat the feat within two weeks. See the graphics of the escape system test launch at the Canadian Arrow website. Robert Hickman (The Aerospace Corp.) - advocates "hybrid" system with reusable first stage and expendable orbital stage. Keith Cowing at NASA Watch says that Senator John Breaux (D-La) didn't want about Elon Musk to discuss the SpaceX protest of the Kistler contract in his testimony. (However, it is in the written testimony.) Surprised that Breaux even knows about it much less cares. The SpaceX update is now available, so you can read Elon's comments about the protest. X PRIZE becomes the Ansari X PRIZE... The X PRIZE gets a multimillion dollar contribution: Celebrating Anniversary of Historic Space Flight, Ansari Family's Donation Gives Huge Boost to Future Space Travel and Tourism - X PRIZE - May.5.04. At his presentation at SA'04, Peter Diamandis said that there would be a new "title sponsor" coming soon. This would be in addition to the "presenting sponsor" Champ Car. That is, the Ansari X PRIZE will be presented to the winner by Champ Car. Peter said this kind of distinctions among sponsors was standard practice in the corporate sponsorship world. SpaceX announced that they have a signed contract with Bigelow Aerospace for their first Falcon V launch in Nov 2005. This flight will be a demonstrator of several inflatable habitat related technologies, and will be flown from Vandenberg. Any further details will have to wait for a Bigelow press release (if any is forthcoming). Due to being able to use a non-explosive flight termination system, the price for the Falcon I flight is being lowered from $6M + range fees to $5.9M + range fees. Elon mentioned that price reductions will be retroactively applied to customers who've signed contracts but haven't yet launched - thus insuring them the best price available at time of launch. The pump cavitation issue was successfully resolved, thus overcoming the final major issue with their Merlin engine. Their Turbopump tests were done while integrated onto the vehicle in the vertical position, so they've had chances to prove out many of the critical first-stage systems, not just the pump. They had their first users conference back in March that was attended by several private companies, NASA, and the Air Force. They'll be purchasing a cleanroom facility at Vandenburg that used to be owned by Lockheed Martin. Elon has testified at the Aldridge commission meeting a few weeks back, and will be testifying at the "Senate Subcommittee on Space regarding the future of pace launch vehicles" tomorrow. I hear he will be there in-person. Also, they have tested their stage separation system, which uses pressure-equalized pneumatic pistons instead of springs, with dual redundantly-wired explosive bolts. The upper stage nozzle is made of niobium sheet, thus allowing it to take accidental impacts on stage separation without failure. They were also milling out some excess material to lighten-up their upper stage. Lastly, they've also been doing several tests on their flight computer and on their IMU that so far have been going well. All in all, it looks like they are in good shape for a first launch in late summer or early fall. ... Join the discussion on the Rocket Company. Bigelow contracts a Falcon V... Bigelow Aerospace has arranged for the launch of a spacecraft in late 2005 on a SpaceX Falcon V according to Leonard David: Space Inflatable Project Eyed by Bigelow Aerospace - Astronotes @ Space.com - May.3.04. Robert Bigelow is the owner of the Budget Suites hotel chain. He has promised to spend several hundred million dollars to develop a space hotel. He created Bigelow Aerospace in Nevada to develop Transhab style inflatable habitats. According to the article the flight test would involve "one-third scale hardware [..] to produce important data regarding multiple features of a full-scale spacecraft." Whole lotta innovating going on at Armadillo. In the past year the group developed a mixed propellent (50% purity H202 + alcohol) propulsion system to replace the H202 single propellent system due to the difficulty in obtaining high purity H202. Now in his latest update - Jet Vanes Win - Armadillo Aerospace - May.2.04 - John Carmack reports on results of a jet vane control system that "went from concept to highly successful flight test in just over one month". They tested the vane controls last week on a small test vehicle and achieved stable hover with only a little practice - see the video (10MB mpg). "behavior of this [jet vane] system, both in terms of startup complexity, plumbing / wiring complexity, and flight control responsiveness are so superior to the differential throttling or attitude engine systems we have used before that we feel it is a clear winner. When a jet vane moves, you get torque on the vehicle instantly, as opposed to throttling or starting an engine, which requires a fairly long liquid column to be accelerated, then the gas volume of the engine to change pressure before you get vehicle torque." So they made the major decision to give up on the differential throttling and go with jet vanes to control a single big engine (24” diameter engine, 16K to 20k lbf). See the photo of the disassembled vehicle. Rocketplane progress... Rocketplane Limited (formerly Pioneer Rocketplane) has used the tax credits it obtained from the state of Oklahoma to raise money to develop its suborbital vehicle: Rocketplane sells tax credits - NewsOK.com - May.1.04 - free subscription required (via spacetoday.net). The project has "advanced to the full design phases". The Rocketplane XP will use a rocket engine from Orbital Technologies Corporation plus two jet engines to take a pilot and three passengers to 106km altitude. The craft will returned under power to the Oklahoma Spaceport. I heard the vehicle will be a modified Learjet but the articles says it will be "adapted from the frame of a fighter jet." The "first test launch is scheduled for January 2007." The Rocket Company begins the assembly line production of its two stage RLV and starts to takes orders from a range of customers. See Chapter 25. © 1999-2018 HobbySpace, All Rights Reserved. HobbySpace is a part of Space-H Services.